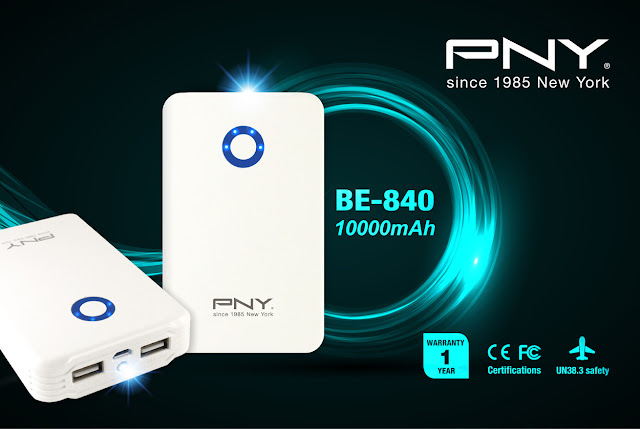 PNY Technologies Inc. one of the world's renowned manufacturer of USB and Memory products has launched the portable and compact BE-840 power bank, with 10,000mAh battery capacity that charges all your mobile gadgets in a flash. The BE-840 comes to the rescue, it can charge your mobile phone several times over. Featuring world-class lithium-ion technology, the power bank is surprisingly lightweight and easy to tote. A multitude of safety features prevent overcharging and overheating, removing the anxiety of travelling with your favorite gadgets. Whether you’re at the airport or in the great outdoors, the BE-840 is the perfect device to recharge the drained batteries of all mobile gadgets. This power bank is a clever multi-tasking charger that sports dual charge ports, which charges up to two mobile devices simultaneously, saving up time and reducing the charge time otherwise used up when we normally plug it into electrical sockets. These dual ports support USB outputs 2A and 1A respectively. Equipped with a smart 4-level LED power indicator that indicates the battery capacity and charge level of the power bank. The power bank also has a LED torch, which you can use in case you want to use this it in the dark, while charging your phone. The BE-840 portable power bank can charge almost all mobile phones and digital devices. It can charge your iPhone, iPad, Android smartphones and replenish the batteries and leave them fully charged. The BE-840 is available in a pocket-friendly price range and offers one year limited warranty on all purchased products. PNY BE-840 10,000mAh power bank is available at the price of (TBA). For more info visit PNY BE 840.